There is currently a lockout between Michigan Infrastructure & Transportation Association (MITA) and the Operating Engineers Local 324 that has caused construction work to come to a halt. The lockout is currently on-going; however, workers still want to finish construction on I-696 by fall 2018. Any questions on the lockout, call 248-387-9696. Eastbound I-696 is on new westbound pavement and is open between I-75 and I-94. Eastbound I-696 exit ramps to Dequindre, Mound, Groesbeck and Eastbound/Westbound I-94 are open. All entrance ramps to Eastbound I-696 from Dequindre to 11 Mile Road are closed. Westbound I-696 from I-94 to Dequindre is closed. 11 Mile Road exit from Eastbound I-94 is open. Northbound and Soutbound I-75 ramps to Eastbound I-696 are open. Northbound and Southbound Couzens bridge over I-696 is closed. 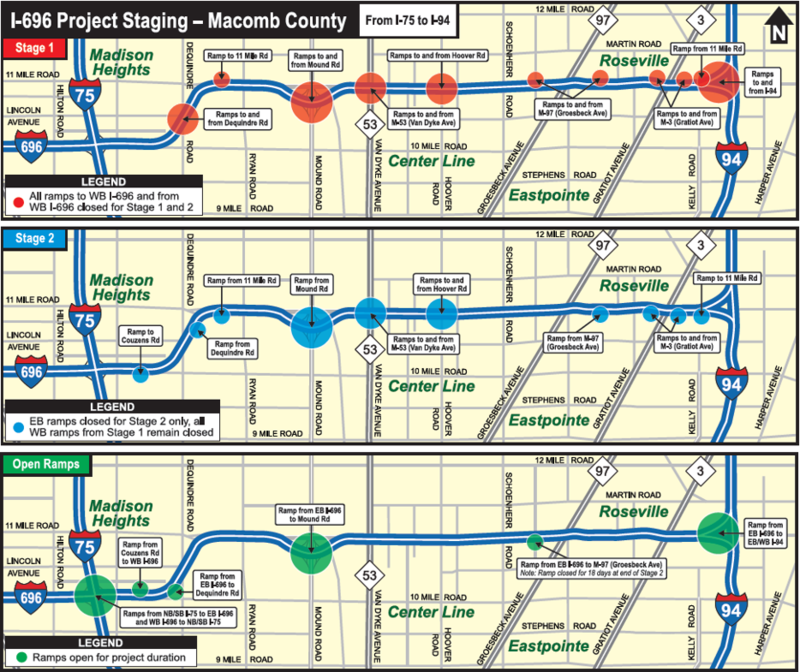 Here is a map of Westbound I-696 Closures from I-94 to I-75.